Use Soap. Help a Kidlet. Be Happy. 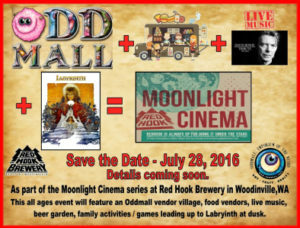 Red Hook’s Moonlight Cinema, Adilene’s Army, and BOWIE! Hey there Sudsers, how’s your week going? The Soap & Clay family has been busy with mostly work and very little play in preparation for a show at Red Hook Brewery’s Moonlight Cinema, where we will be slinging soap while jamming out to some great Bowie tunes and watching Labyrinth in the open air. Food trucks, Oddmall’s always impressive merchant circle, beer, and a Bowie Tribute – what’s not to love? I have a new line of beer soaps made from Red Hook’s brews that I can’t wait to release. We also spent a lot of time at Freighthouse Station in Tacoma, working on the build-out for Soap & Clay’s very first retail location! As a result, we all ended up covered in all manner of construction grime, which the Soap & Clay kids loved. Me? Not so much. I make soap for a living; it is to be assumed that I don’t like being dirty. So at the end of each day, I definitely needed a bath. And a shower. And a rub with a scrub in between. I didn’t really have time for all of that, though, so I needed a soap that would work hard to purge my pores of all impurities while locking in moisture. That soap? C’mon Get Happy! 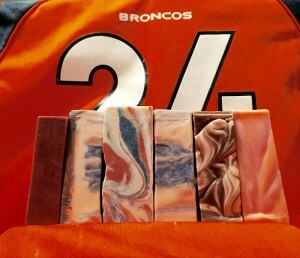 Look for more information (and a coupon code) for this hard working soap in Sunday’s Soap Case! Now for some serious stuff. I want to talk about something even more important than events and shop news. This little girl? Is Adilene. She’s two. And has ALL. She’s been undergoing chemotherapy treatments since she was diagnosed in December. Those two smiley grownups? Are her parents, Jessica and Fred Korpi. Their ability to remain positive and upbeat while living every parent’s worst nightmare is inspiring. And that cute little dude in the duck towel? Is her bright and energetic big brother Blaiden, who loves his little sister fiercely. When I learned of Adilene’s diagnosis, I felt like I wanted to help this family in some way. I know I’m not alone in that feeling; most people experience this when confronted with a problem that they can’t fix. Jessica’s family felt the same way, so her cousins Kella and Chera organized a 5k Fundraiser to assist with medical expenses. This event will be held on August 13th in Sanford, Colorado. While I can’t be there for the event (kind of a trek from the PNW), I can help by donating a portion of my sales. So that’s what I’m doing. 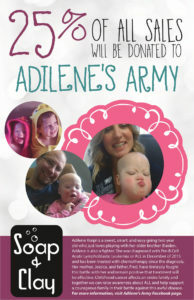 From now through August 1, 2016, 25% of all Soap & Clay sales will be donated to Adilene’s Army 5K Run/Walk. So membership boxes? Insanely popular right now. From clothing to baking kits, there’s not much you can’t get delivered to your door on a monthly basis. The concept is simple and appeals to people from all walks of life. For the super busy super humans that don’t have time to shop, subscription boxes are a great way to get their favorite products, update their wardrobes, even get fresh produce without having to visit a dozen stores. For the aficionados of the world, subscription boxes deliver fun and exciting wine, food, baking, fashion and beauty products every month, ensuring that they are always in the know. For the truly madly deeply passionate fanboys and girls out there, monthly boxes slake their thirst for everything trendy and new. No matter the motivation, monthly subscription boxes are guaranteed to deliver satisfaction. 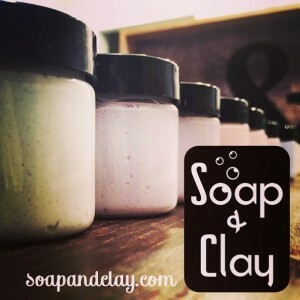 Soap & Clay is joining the subscription box fun by teaming up with Lavish Bath Box! This company really has its finger on the pulse of the bath and beauty world and has assembled a rockstar group of artisans to deliver subscribers the best and most exciting soaps, scrubs, lotions, bath bombs, bubble bars, and bath accessories. Each month, Lavish Bath Box ships out a beautifully packaged boxed packed with high-quality, fun, skin-loving products all centered around a monthly theme. This month’s theme is Interstellar, a collection of out of this world crazy awesome products. Check out those bath bombs! Soap & Clay’s contribution? Lemon Galax-Tea, a mini whipped sugar soap scrub that smells good enough to eat! Don’t eat it. We’ve been through this before. The soap whip is super bubbly, ultra cleansing, and the perfect all over body exfoliant suitable for all skin types. Each package contains enough goodies to get subscribers through a full month of pampering. As an added bonus, each monthly box will include a bath accessory – this month’s bonus is a soy candle from Soy Much Brighter. These clean burning candles burn brighter, longer, and don’t release chemicals into your home like paraffin candles. What a great bonus, right? Tell me you wouldn’t want to find that on your porch. 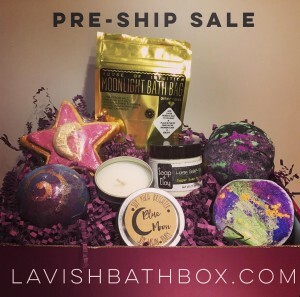 Lavish Bath Box has a great subscription plan set up – you can choose between one month, three month, and six month options for discounts each tier. Each option includes free shipping for your boxes, so no hidden fees! I’m a fan of no hidden fees. You can also cancel at any point for any reason – no fine print! I’m a fan of no fine print. For more information, visit Lavish’s site! For more information on the Soap & Clay products you can expect to see in the membership box, check out our shop! Which means you get super deals! Yesterday was a nail biting, nerve wracking, breath holding day that ended in a BIG BRONCOS WIN!!! For the second time in three seasons, the boys in orange and blue will be heading to the Super Bowl. Our house was in full celebratory swing yesterday – cheering until we were hoarse, giggling every time Tom Brady ended up on his back (we aren’t nice people) and eating delicious, Colorado inspired food. Any appearance at the Super Bowl is a big deal, but getting to play in Super Bowl 50 feels monumental. The Denver Broncos have made it to the big game several times (and won a couple), but this one? The celebration of a 50 year tradition? Incredible! So, because it’s such an exciting event, I am throwing out an exciting event of my own. On, you know, a much smaller scale. Ready for it? FOR THE NEXT 24 HOURS, EVERYTHING ON THE WEBSITE IS 50% OFF! Everything! You know, the usual way. With a coupon code! Enter coupon code WERIDETOSB50 to get 50% off of your cart. This offer expires at 4pm EST on January 26, 2016, so don’t delay! Thanks to all the fans, be they representing orange and blue or not, for an amazing NFL season. I know I had a great time! Go Broncos!! On to Super Bowl 50!! Holiday Gift Sets: Small Business Saturday Specials! This holiday season, give the gift of healthy skin! Happy Wednesday, Sudsers! I hope everyone is looking forward to the holiday weekend. Hooray, turkey! I’m sure you’re all busy with final preparations, but I wanted to get some information out on our holiday gift box lineup. I have some fun gift sets that will be available for purchase Friday, November 27th. 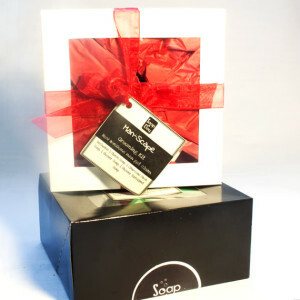 These box sets are great gifts for everyone in your life; who doesn’t need soap? For fun, unique, thoughtful, and useful gift ideas, scroll through to check out the box sets that will be online and ready to purchase this Friday. Each box set lists at $25! They will be part of November’s Buy 3 Get 1 Free sale AND on sale for 20% off on Friday and Saturday. What an amazing deal! How awesome men get clean! How many men in your life use their shampoo to wash…everything? Let’s give them some incentive to stop, eh? The Man-Scape Box is packed with our most popular scents from the men’s line, skin loving moisturizers, exfoliators, and so much fun that even those low maintenance men will enjoy upping their grooming game! 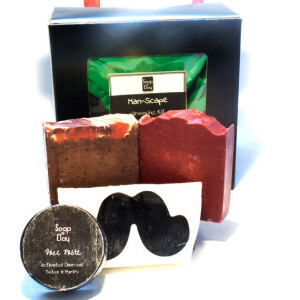 This awesome gift box contains a shaving soap, a shower bar, an exfoliating shower bar, and an activated charcoal face bar. Much better than another tie and shirt combo; give your favorite men a useful gift that they’ll appreciate! Shave soap and face soap remain constant, two shower soaps can vary. We put the ahhh in spa! The ultimate in relaxation, The Spa Box is perfect for the overworked, overtired, overextended women of the world that need (and deserve!) a trip to the spa. Bring the spa to them! Skin softeners, soothers, and polishers – this box contains everything needed for a perfect tub experience, minus the wine and soothing music. This box contains a skin softening bath bomb, a luxurious spa bar, a velvety mini-whip, a detoxifying and clarifying activated charcoal face soap, and a super gentle yet super effective pumice powder face exfoliator. Pamper your favorite lovely lady – she’s earned it! Face bars remain constant; spa bar, bath bomb, and mini whip may vary. Be bright. Be luxurious. Be you. The Lux box contains everything needed for healthy, glowing, beautiful skin! Soap & Clay’s best-selling scents, moisturizing shower soaps, and skin clarifying face bars (buh-bye stubborn acne!) 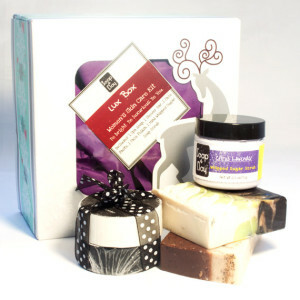 that will heal and soothe even the most troubled skin are all snuggled up together in this luxurious gift set. Each box contains one shower bar, one healing/exfoliating bar, one mini whip, one activated charcoal face bar, and one pumice powder face bar. Every woman will appreciate and enjoy this box-o-beauty! In addition to these three sets, we will have a 4-pack of holiday soaps, a Bomb Box (HOORAY!!! ), and our Limited Edition Winter Line available for purchase on Friday, November 27th. While you’re planning your Black Friday shopping, don’t forget to support your favorite small business! We like you more than those box stores, I promise. Enjoy your Thanksgiving, Sudsers; we will see you on Friday!